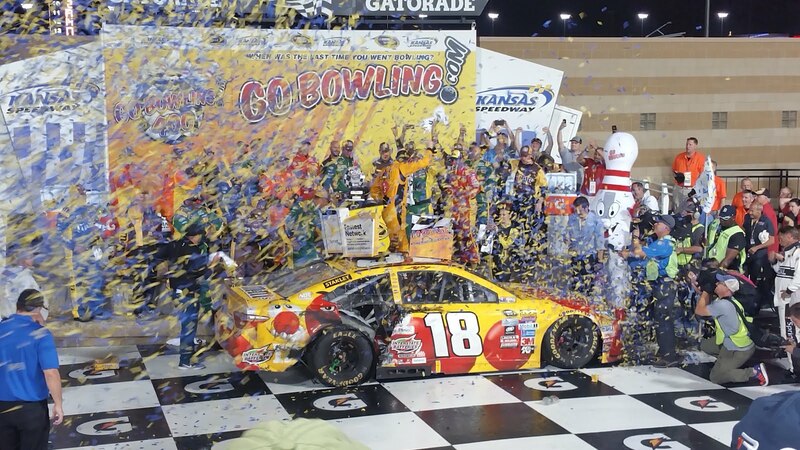 Kyle Busch roared his way to Victory Lane on Saturday night at the NASCAR Sprint Cup Go Bowling 400, a day after his driver William Byron won the Camping World Truck Series race. The Joe Gibbs Racing No. 18 driver had never finished better than third at Kansas Speedway, but earned his 37th Sprint Cup win at one of the three tracks at which he had no victories. He was so excited he blew out his right rear tire, taking the right rear quarter panel of his car with it. Only Pocono and Charlotte remain as tracks where Busch has not won. "I want to hurry up and get to the two [tracks] he hasn't won at. He's hot right now," team owner Joe Gibbs laughed. He added, "I don't know if any of our teams have ever been this hot. [The No. 18 has] been up front every single week, and it's great to watch it." Martin Truex Jr. dominated nearly all of the race, leading a race-high 172 laps, but Truex's bad luck this season continued, and a win was not in the cards. An unknown object jammed in a wheel at a pit stop forced the No. 78 to pit again under green flag conditions on lap 214, putting him a lap down. He received the Lucky Dog after a wreck caught up Denny Hamlin, Brad Keselowski, Kyle Larson and Joey Logano on Lap 241. Truex crossed the finish line 14th. Logano and Hamlin were taken to the infield care center, evaluated and released. By then, Busch had the lead after pitting on Lap 211 and staying out during the next caution on Lap 235 while the rest of the leaders pitted. Once he took the lead, he did not relinquish it. He stretched his lead to over a second with four laps to go and sailed his Red Nose M&Ms Toyota past the checkered flag for his third win of the season. "The last couple of cautions gave us the opportunity to cool the tires down. The other guys had [newer] tires, but when you're out front and focused on hitting your marks and the restart, and doing what you can do, then you get an opportunity to try to drive away. Harvick was making it tough; he was on my bumper for a few laps. I pulled a slide job off turn four, cut it a little bit close and we touched a little bit. But after that I refocused on being able to hit my marks," Busch said. Kevin Harvick came in second and keeps his points lead over Kyle Busch by just four points. It was his ninth top-10 finish this season. At one point, he almost caught Busch, but the No. 18 quickly edged ahead. "[We] hit a big piece of debris and knocked a big hunk out of the nose and it knocked the splitter down. From that point on, it was tight. Otherwise I would have drove around him," Harvick said. Kurt Busch took third place, his seventh top-10 so far this year. Ryan Blaney was the highest finishing rookie, finishing fifth ahead of Austin Dillon. Fellow rookie Chase Elliott remains the leader in the Rookie of the Year standings. Elliott is currently 11th and Blaney holds the 16th points position. Ryan Newman, AJ Allmendinger, Chase Elliott and Brad Keselowski rounded out the top 10. Thank you lorrilynn! I'm glad you enjoyed it.